All video games have a history... a history of rumors and official statements, of leaks, of screenshots, of trailers and other things that excite us, confuse us or do both. So how do we get from the smallest hint of a new game to the real thing? What's the journey? Today, we're debuting something a little different: a Kotaku Timeline—a timeline that tells the tale of the public emergence of the biggest, most interesting video games. The first game we're giving this treatment to may well be the biggest game of 2013: Rockstar's Grand Theft Auto V. We'll be updating it in the months to come, through the release of the game and beyond. An ad featured in the GTA IV addon The Ballad of Gay Tony, which is a parody of the 2009 film New York, I Love You, seems to signal that GTA is leaving the New York-inspired Liberty City of GTA IV. There is much debate in the GTA community over whether this is a genuine hint or simply a joke. 12:30pm—Fans find possible hint of a character who might be in GTA V. Maybe. Kind of. Another possible clue spotted: during the end credits of GTA IV's The Ballad of Gay Tony, the character Packie McReary takes a taxi to Francis International Airport. The theory is that he's en route to the sequel. Newspaper: "The script he will end up co-writing will run to around 1,000 pages, nearly ten times as much as a feature film." Rockstar co-founder Dan Houser, in a lengthy interview with The Times of London, mentions work on the next GTA so casually that it sounds rather inevitable. Because, you know, people just leave that kind of thing out there. Well, at least we can all laugh at it now. GTAV.net: "...an independent source had informed them that Rockstar is definitely researching locations "around Hollywood... and the surrounding area." A report (if you can call it that) today on VG247 suggests that Grand Theft Auto V will be set in Hollywood. Later, Eurogamer reports that Rockstar is, indeed, doing research around Hollywood. A bunch of URLs registered by Rockstar-owning publisher Take-Two—among them gems like CashforDeadDreams.com and SixFigureTemps.com—suggest Rockstar wants to satirize the recession this time around. Except maybe at the time of writing there'd still be nothing interesting on these sites. Rockstar announces a casting call for characters that would fit perfectly into any GTA title—including one with the same name as a pedophilic radio host from GTA IV. Coincidence? May 26—GTA V set to be unveiled in 2012? Take-Two: "...we have a very strong pipeline of titles in development." In a quarterly financial briefing, while talking about the 2013 fiscal year, Take-Two CEO Strauss Zelnick hints that something big is coming. June 21—GTA V in 2012? You're damn... right? Gamespot: "The sources said a 2012 release was "pretty likely," adding that the game's scale was vast." A report by Gamespot reveals that GTA V has already been in development for quite some time. Given that Sam Houser being heard saying "Good day" so quickly that it might have sounded like "GTA" could constitute a GTA V update for news-starved fans, the fact that Rockstar gives a shoutout to the GTA faithful during a Max Payne 3 Q&A on their very own Newswire is kind of a big deal. Kind of. October 25—It's real. GTA V to be revealed in one week! The debut trailer is scheduled for November 2. Only Rockstar would dare to run a trailer for an upcoming game during the heavy fall release season and know full well that, on that day, no big fall games will matter. Kotaku: "Rockstar doesn't need anyone. Everyone else who makes video game platforms needs Rockstar." Kotaku explores the implications GTA V's release could hold for various game platforms. 1:00pm—Are these the best cities for GTA V? We analyze possible locations for the new GTA title. 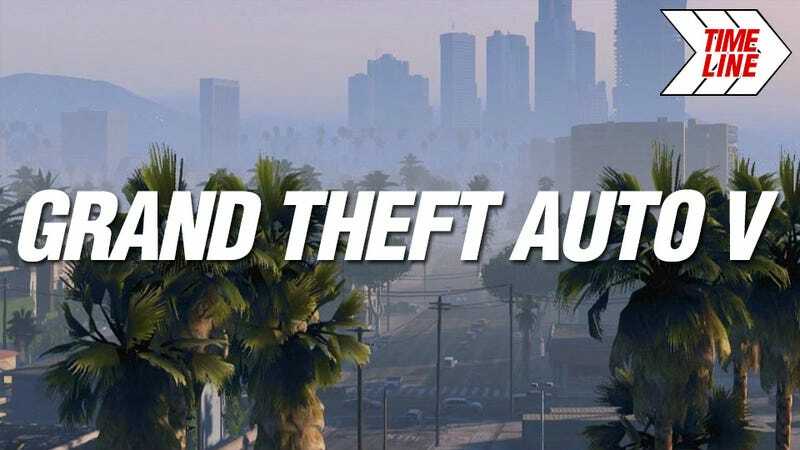 Sources familiar with the game confirm long-standing rumors that GTA V is, indeed, set in a fictional version of Los Angeles—and one tosses in a tantalizing bonus claim that the game will have multiple protagonists. A Reddit user points out that the "FIVE" at the end of the game's logo is lifted from old U.S. paper currency. But what does it all mean? The announcement of Grand Theft Auto V's trailer coming out inspires Youtube user GermanScientistTV to record this lovely tour of GTA IV's Liberty City. The Taiwanese group Next Media Animation show us what they think the new GTA V teaser will look like. November 2—The first GTA V trailer has arrived! We talk about how the first trailer for GTA IV depicted the game we all know and love. The GTA V trailer has landed! It features a man talking about retiring to the city, overlaid over a montage of scenes from the game. Kotaku does a little detective work and finds out which song was playing in the background during the new trailer. We comb through the new trailer, picking out various interesting tidbits and analyzing them. IGN confirms that the voice actor of GTA: Vice City's lead character wasn't doing the voice in the new GTA trailer. 11:20am—What if we run over a dog in GTA V? Commenter Nostrapadamous, after seeing the dogs present in the trailer, delves into the matter of virtual animal abuse (accidental or otherwise). 1:20pm—Will GTA V feature old GTA characters? A sharp-eyed Reddit user notices that three figures in the GTA V trailer resemble the protagonists of GTA III, GTA: Vice City and GTA: San Andreas. Rockstar: "Grand Theft Auto V focuses on the pursuit of the almighty dollar in a re-imagined, present day Southern California." Rockstar Games officially announces GTA V on their Newswire. Rapper Dan Bull writes a song in reaction to the new GTA V trailer. November 14—Can this man be the star of GTA V? Kotaku looks into the rumor that the man narrating the GTA V trailer was voiced by none other than Ned Luke. A youtuber recreates the GTA V trailer in GTA IV. December 15—It's time for a female hero in GTA! Kotaku looks at historical representations of female criminals in the media, and speculates on how well Rockstar would handle writing one. Rockstar: "...expect that we'll be talking much more about GTAV starting at some point in a few months' time." Rockstar confirms that there will be no GTA V-related news for a while—at least until after Max Payne 3's spring release. March 6—Could Mafia II developers be working on GTA V? VG247 discusses a rumor that 2K Czech, the people responsible for Mafia II, might be working with Rockstar on GTA V.
March 22—GTA V's multiplayer will feature "crews"
Houser: "...by creating crews through Social Club, the crews that you create in Max Payne 3 will be ready and available for you to play in Grand Theft Auto V from day one." In an interview with IGN, Dan Houser reveals that GTA V will support the new Crew system for multiplayer, which debuts with Max Payne 3. In a tweet, Young Maylay, Carl Johnson's voice actor, confirms that he won't be returning to voice the protagonist of San Andreas in GTA V.
While waiting for updates on their most anticipated game, the folks over at GTAForums mark a Google Map of Los Angeles with the real life versions of locations pulled from the the GTA V trailer. A GTAV.net community member recreates the GTA V trailer (again), this time using San Andreas. While playing Max Payne 3, GTAForums user CantPauseToast stumbles upon several photos which seem to depict planes featured in the GTA V trailer. We, after having a go at Max Payne 3, talk about which parts of the game should Rockstar use to improve GTA V.
Rockstar begins their viral marketing of GTA V, via a series of tweets from the Epsilon Program, a religious cult last featured in GTA IV. They did it again! Battlefield 3 is the latest game to get the GTA V trailer treatment. Rockstar releases more GTA V screenshots, this time featuring the game's vehicles. August 22—GTA V is looking gorgeous! A new batch of GTA V screenshots released by Rockstar, titled "Leisure", showcases the game's stunning vistas and fun activities. August 24—Here's a hot new batch of GTA V screenshots! Rockstar continues teasing their fans with "Business", yet another batch of GTA V screenshots. Game Informer's Andy McNamara tweets that he's at Rockstar HQ, checking out a playable build of the game—which means there's definitely some news coming soon. October 18—Got ideas for GTA V's multiplayer? Tell Rockstar! Rockstar asks their fans on their Newswire what they'd like to see in GTA V's multiplayer mode. A piece of concept art shows up on Rockstar's Instagram feed, along with a promise of more news to come in November. October 27—Hey, we've got a release date! Probably! Polish fansite gta-five.pl somehow manages to get their hands on several GTA V posters that show a release date of spring, 2013. October 30—The confirmations just keep coming! In a tweet screencapped by IGN, the UK retailer confirms the recently leaked release date for GTA V. Game, obviously, wasn't willing to keep the tweet around for too long. Rockstar: "Starting next week November 5, 2012, Grand Theft Auto V will become available for pre-order everywhere." Rockstar finally confirms the release date themselves. November 1—Storms and posters, oh my! Rockstar: "Unfortunately Hurricane Sandy has derailed our plans somewhat, but we will have something to show soon." It seems that Kotaku is not the only one in trouble. Rockstar, on their Newswire, tells their fans that the second GTA V trailer isn't coming as soon as they've hoped. Game Informer publishes two great-looking high-resolution GTA V posters. Kotaku reminisces about the heroes and villains of GTA—and also tries to spot patterns in their design. Rockstar reassuringly tells everyone that there's no need to worry, 'cause the new trailer is landing on November 14th. 6:40am—GTA V to star an "East Coast gangster"
According to CVG, our brand new protagonist is an ex-gangster trying to escape his past. Since we're talking about a GTA game here, it's pretty likely he doesn't succeed—at least at first. 12:00pm—GTA V to star not one, but three characters! Courtesy of Game Informer, here are the main characters of the next GTA. 3:10pm—GTA V's gonna be HUGE! Kotaku: "There's wilderness, a military base, and even an ocean floor to explore underwater." Game Informer's cover story reveals a myriad of facts about the new GTA. Kotaku has a roundup. Unlike previous GTA titles but like some other Rockstar titles, GTA Vwill feature an original score. Can it surpass the previous games' radio stations? If it takes six and a half hours to speedrun GTA III, how long will it take for GTA V? Kotaku tries to estimate the game world's actual size. Houser: "I think it's fair to say that [our games] are set in a world that is a satire of American media culture." Dan Houser talks about what inspired GTA V.
Courtesy of Gamer.nl and GTAV.net, here's a brand new batch of screenshots. We finally get a closer look at the new protagonists. Houser: "We wanted to make a big place, as much as anything, to allow you to fly." Dan Houser steps in to reassure fans: the game's size won't be its downfall. Dan Houser explains to Famitsu why they didn't want to wait until the next console generation to release GTA V.
Here it is, as Rockstar promised: the second GTA V trailer. Just like last year, Kotaku is quick to identify the song behind the new trailer. Do you have a skeleton in your closet? Is it possible to literally go bonkers for video games? Shanko Shizz shows us that the answer is yes. We know that GTA V will look better than GTA IV. But how much better? A GTAForums dweller has the answer. Russian artist and GTA fan Ilya V. Boykov offers his own stylish take on the second GTA V trailer. A tumblr user does everyone a huge favor (if you can call it that) by collecting the best of the best GTA V trailer comments. A youtuber recreates the second GTA V trailer in GTA IV. Hmm, deja vu. Ever heard of Patrick Brown, the artist? He's supposed to be pretty good. In any case, here's his take on GTA V.
A few disgruntled fans, upon discovering no solid evidence of a PC version being released, created a petition. Now, online petitions are a dime a dozen and they're rarely effective, but ye gods, has this one gotten huge. A dedicated GTA fan and LEGO aficionado recreates the first GTA V trailer in LEGO. Polish fansite Rockstar24 shows us how much the world—GTA's world—has changed in nine years. December 19—Who the heck is OG Solo? The voice actor for one of GTA V's main characters, apparently. December 24—Rockstar's Christmas gift: GTA V shots for everyone! Rockstar spreads some holiday cheer with fighter planes, sharks and rottweilers. December 28—You know what we need? More trailer remakes! One YouTube user has a little bit of fun with the characters from GTA IV. Rockstar celebrates the new year by handing out a bunch of GTA V concept art wallpapers. A GTAForums user posts his exciting new-concept-art-related findings. "Today, we have an official release date to share with you: Grand Theft Auto V will arrive in stores on September 17, 2013." Rockstar, after a long wait, finally reveals GTA V's release date—but, as it turns out, there will be a delay. A PlayStationAccess correspondent explores the real-world locations behind the game's screenshots.